This has not been a good day for me. My cell phone came to a tragic end today. It dropped out of my cell phone holder while I was mowing my lawn…. need I say more. The picture is worth more than I could write about it all. 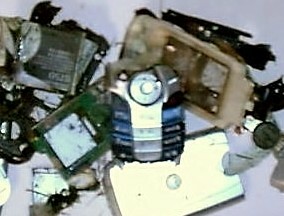 Please send your phones too me again via email, rebuilding the phone book is the part that is most upsetting. I did send you my "phone". It must have gotten lost in shipping? !